Every time you bow your head in prayer, open up a blank document on your computer, or flip open a journal page to write, you’re taking a leap of faith. Writers choose to believe they can string together another series of sentences that will speak to the needs of readers somewhere. When people pray, they’re choosing to believe there’s a good, loving God reaching out to us, listening to our prayers, and meeting with us. We have faith that the discipline of writing will pay off. If we keep working at it, keep practicing, keep asking for feedback, keep revising, and keep publishing our work wherever possible, we’ll get better, reach more readers, and take meaningful steps forward. If we face the most challenging and vulnerable parts of our lives, we have faith that we’ll find words that offer clarity and perspective. If we put our words in front of readers, we have faith that some will reply, “Yes! Me too!” If we take the time to continually examine ourselves and care for ourselves, we have faith that the words will continue to come together year in, year out, whatever life throws at us. We have faith that the practices of silence, praying with scripture, or reciting the prayers passed on to us will bear fruit over time. If we continue to fight through our fears and anxieties in order to sit in silence, we trust that God can meet us, even if it leads to results we aren’t expecting or doesn’t even result in quantifiable progress. If we continue to cultivate habits of stillness and quiet throughout the day, we have faith that God can meet us and will speak even at moments when we aren’t expecting to hear anything. If we continue to wait on God, we have faith that periods of silence don’t indicate God has abandoned us. We can even have faith that growing in one practice could lead to growth in the other. Every time I grow as a writer, my prayer time receives direction. Every time I grow in my prayer time, my writing has increased clarity. Writing and prayer stand well enough on their own, but many of the disciplines that help you write better will also help you pray better and vise versa. This wasn’t something I planned out. I never set out to find connections between the two. Rather, I spend significant parts of each day writing and praying, and at a certain point I started to notice how the two converged. As I prayed, my writing started to shift and grow. 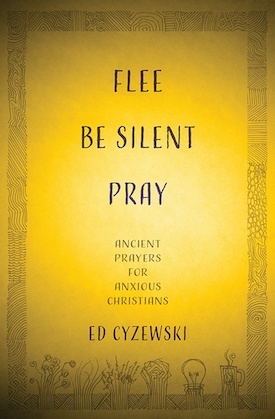 Both the disciplines of prayer and the lessons I learned transferred over to my writing, and my writing furthered my personal reflection and helped foster the habits and disciplines I’d been cultivating while praying. When prayer and writing finally started working together in my life, I began to take significant steps forward in both simultaneously. The two require many of the same practices, disciplines, and virtues. Of course you should certainly only pray out of an interest to meet with God on a deeper level, just as you should only write if you have something to say or process. I’m not trying to tap into the commercial writing potential for prayer or to guilt the reluctant into writing. Rather, I want to drive home the point that prayer and writing not only happily co-exist, but also feed off of each other and can benefit each other. Order your copy on Amazon for $1.99 until March 16. Congratulations on your launch! I’ve enjoyed reading your posts this week, especially over at Micha Boyett – I loved Found, and the Examen is so special. I recently read that Ignatius advised busy Priests to give up every prayer if you must, but never the examen! !